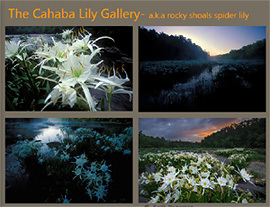 Locally known as the Cahaba Lily, the shoal lily has become the most recognized symbol of Alabama's natural beauty. Naturalist-explorer, William Bartram is credited with being the first to describe them in the year 1773. They once flourished throughout many southeastern rivers, but today their survival is threatened. Fortunately, in recent years public awareness has been growing dramatically. 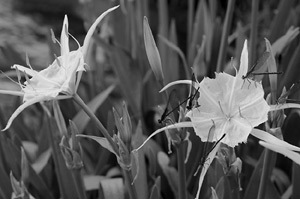 Every spring there is a resurgence of news, articles and interest in the beautiful Cahaba Lily. Canoe trips are available to explore them. In late May there is an annual Cahaba Lily Festival at West Blockton, and you can even buy your Alabama car tag with a rendition of the lily on it, in support of the Cahaba River Society. As one who has photographed Alabama's natural beauty for more than thirty years, I regard a stand of Cahaba lilies in bloom as one of our most beautiful natural sights. Late in the day when the glare of sun subsides and shadows creep over the landscape, thousands of delicate white flowers sitting atop the river become an impressive sight. 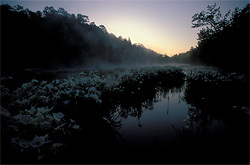 Cahaba lilies are even more beautiful at dawn when a fog flows through thousands of fresh new blooms. My first exposure to the Cahaba Lily was more than 40 years ago. My dad bought a mail order plan for building a little flat-bottomed boat with marine plywood and one summer day we launched it onto the Cahaba at Highway 280. I was struck by the thousands of black mussel shells piled along the riverbank. My dad informed me that people would collect them to cook over a fire on the riverbank, leaving piles of shells behind. There were no lilies in bloom on that hot day or I would surely have remembered, but I do recall plenty of the green stalks. I was curious why these odd looking, three-foot tall stalks were scattered about the river. At places we had to get out of the boat and drag it over rocks and I recall a pungent odor when we trampled over the stalks. It's not like they were endangered or of any concern to anyone. Back then the Cahaba was as unique as it is today. In this free flowing river you find shoals and shallow areas where you can wade around on a stone bottom. Whenever you look into these shallow waters, there always seems to be something of interest, if nothing more than the topology of the river bottom. My dad informed me about the redhorse suckers schooling along the riverbank. "You won't catch them on a hook," he said. "You have to snare them. You take a thin wire with a loop and hold it in the water until a fish goes through it, then jerk the wire. "It seemed like a far-fetched way to try to catch a fish but on a later trip I got to try it. I leaned on a tree trunk that extended over the water and submerged my snare into a school of eight or so suckers holding in a current. They scattered but I remained motionless and they soon returned. Ever so slowly I maneuvered the wire onto a fish and to my surprise, pulled it out on the first try. Redhorse still live in the Cahaba and love to feed on small snails, which are a good indicator for good water quality. At the Cahaba River NWR and Hargrove Shoals you can see thousands of snails on the rock bottom, some places so thick you can't walk without pushing them aside or stepping on them. Before the construction of hydroelectric dams, which dramatically raised water levels, other Alabama rivers had more in common with the Cahaba. 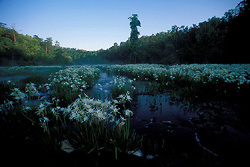 The worlds largest stand of Cahaba Lilies used to be at Squaw Shoals, 26 miles up from Tuscaloosa on the Black Warrior river. Alabama's dammed rivers are much like a series of lakes. In these deep impoundments, you can only imagine what lies beneath the surface, but in the natural flowing Cahaba you can see interesting varieties of fish, snails, turtles, amphibians and other aquatic life. Prehistoric sturgeon still live here as do a number of other uncommon species. Dragon flies and other small creatures occupy the river and a hawk moth is primarily responsible for pollinating the lilies. In Bibb County near the Cahaba is perhaps the most significant diversity of plant life in the southeastern United States, with at least 76 rare species of vascular plants. Eight plants which were previously unknown to science were recently discovered there at the Ketona Glades, making it one of the most unique botanical discoveries in the continental United States over the last 100 years. The Little Cahaba River, a tributary of the Cahaba, flows through the 480 acre, Bibb County Glades Preserve, which is home to 61 rare plant species and open to the public. Today, the 191 mile Cahaba River is the longest of the few free flowing rivers left in Alabama and no other river in North America has more species of fish per mile with a total of 131. Due to a growing appreciation for our natural resources, we are fortunate that in 2002, the 540th National Wildlife Refuge was created in Bibb County - The Cahaba River National Wildlife Refuge. If you have never actually seen a Cahaba lily, it is now quite easy to see for yourself what all the fuss is about. You can join the growing pilgrimage of enthusiasts who visit the refuge each May and June. Walk along the banks and rejuvenate your spirit while gazing at perhaps the largest stand of Cahaba lilies left in the world (This is contested by the stand at Langsford Canal in South Caroling). And cleanse your soul, or at least your feet, while wading the shallow waters amid the fragrant lilies. Take your camera and you can capture a wonder of nature that may eventually disappear forever. 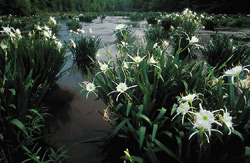 The Cahaba Lilies begin blooming in early May and last into late June. It varies from year to year but Mother's Day weekend and the two weeks after is a good time to find them in full bloom. If you want to photograph them, don't go after a period heavy rain because they will be beaten. High wind will also damage them, and even a long hot day of sunshine will leave them a bit ragged. Each delicate, lightly fragranced flower blooms for one day, then withers away. 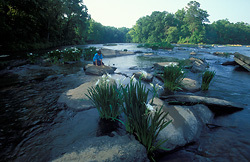 The Cahaba River NWR and Hargrove Shoals is about 30 miles southwest of Birmingham in Bibb County. To reach it from Birmingham, make your way to West Blockton, then take County Road 24 for about five miles and take the unpaved road to the right, just before you reach the Cahaba River bridge. There is a sign but it's hard to see until you are passing it. Just cross the river and turn around. 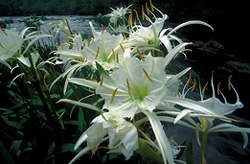 The dirt road runs alongside the river for over a mile with plenty of lilies to see. If you like you can park and wade the shallow, narrow Caffee Creek to reach more lilies and about 15 minutes walking to Hargrove Shoals. Canoeing the Cahaba is also an option. It is the most floated river in Alabama. The section that runs through the Cahaba River Wildlife Management Area contains no white water and unless the water is high, is appropriate for paddlers of all ages. I understand the Cahaba River Society provides "guided" canoe trips. One of their web pages also has a good description of put in and take out places if you bring your own canoe. Some outfitters will rent you a canoe for a day, the weekend, or a week, take it anywhere you like. 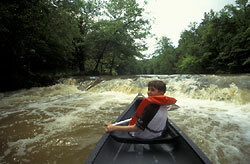 If you are not used to canoeing, a good way to "get your feet wet" is a five mile trip offered by Alabama Small Boats. At certain times of the year they will shuttle you to Buck Creek in Old Town Helena and you flow downstream into the Cahaba and back to your car at the Alabama Small Boats lot on Shelby Co 52. There are a few lilies on this five mile trip. You can check to see if they still offer a ten mile Cahaba trip from the Riverchase area. Another option is to canoe the Little Cahaba, offered by Bulldog Bend Canoe Park in Bibb County. It's a peaceful trip except for the one drop you see in the photo of my son. The flowers of plants have evolved to make it easy for butterflies and other pollinators to find and feed on their nectar. 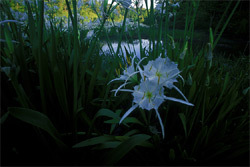 Cahaba lilies utilize visual contrast to accomplish this. 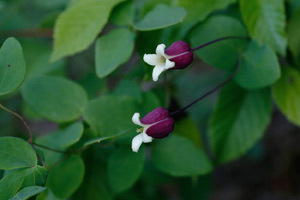 They are much the opposite of morning glories which open in the morning with bright beautiful color to attract daytime insects and birds, then die in the afternoon. Instead, Cahaba Lilies open late in the day in preparation for pollination by the Trumpet Vine Sphinx, a nocturnal hawk moth. 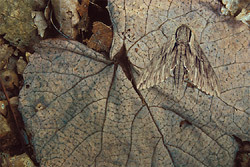 Although the moth is able to see color even in faint starlight, the white flowers contrast sharply against dark surroundings making them appear as beacons of light in the dark. We all know how moths are attracted to lights at night. The hawk moth also has a form of visual memory which helps it see in faint starlight. J.H. Lovell, in The Flower and the Bee, recounts an experiment in which a moth was released 900 feet from a favored honeysuckle. The creature made a beeline for the plant's fragrant blooms. 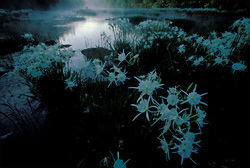 If you walk among the Cahaba lilies you notice the fragrance. It's not particularly appealing to me, but I'll bet the hawk moth finds it heavenly. This fragrance calls out to moths in the woods for miles around. The hawk moth is not the only visitor. Numerous insect species act as pollinators. 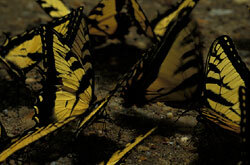 Bumble bees and butterflies such as the blue swallowtail, silver spotted skipper and tiger swallowtail are common visitors. The Cahaba Lily does not seem to fit into a rigid pollinator syndrome, but rather depends on a generalist pollinator community. The Cahaba River NWR is not the only place you find the Cahaba Lily. It grows along small streams and rivers that drain off the Fall Line. In Alabama you find Cahaba lilies in the Cahaba River, Hatchet Creek, Mulberry Fork and Locust Fork as well as some of their tributaries. I hear there are a few below Jordan Dam on the Coosa River where there is managed free flowing water. There are also scattered populations on the Tallapoosa River. If you enjoy exploring remote places, my favorite is Hatchet Creek. It is one of the most pristine and undeveloped rivers in Alabama, as well as one of the most beautiful. I took a canoe trip one Saturday morning and had the creek to myself. If you put in at Kings Bridge near Rockford it's not far to the main stand of lilies. In May, 2006, I made arrangements and was able to be at the lilies right at daybreak. I pushed the canoe aside and got out with my camera and tripod. I walked around on dry stone, occasionally wading from one area to another. A cold front had left the air crisp, but the water felt warm running over the shoals and a light fog hung over the lilies. This may be the most beautiful stand of lilies in Alabama because they blanket the picturesque river. After taking pictures for an hour or so, I floated downstream as the lilies became more and more scattered. I soon came upon three deer standing in the shoals. Two of them glared at me, heads erect, trying to surmise what I was. The buck was turned away but there was no use trying to get to the camera without him hearing me. If you spend much time alone in nature, you will experience moments of awe, gifts of living on earth, that are yours alone. As soon as the bottom of the canoe touched a rock the buck turned to see me and they scampered into the bush. The trip down river required some wading and dragging the canoe over shoals because it had been a dry spring. Lilies gradually diminished along with the shoals until they disappeared altogether. Eventually I could sit comfortably with minimal paddling, and enjoy the slow current pulling downstream. Whereas the water had been warm running over the shoals, in the deeper pools it was cold. I took out at a sandy beach at County Rd 18 where my van was parked. You can also put in at Kings Bridge and take out at Double Bridge. That's an all day trip, 6-8 hours, depending on the water level. The trip is better when the water level is up or you'll be dragging your canoe a lot. The very last section of shoals are picturesque with a nice stand of lilies. 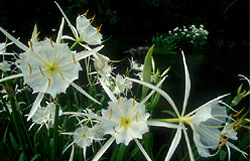 While Cahaba Lilies are not on the endangered species list yet, they are endangered. Once common throughout the southeast, today only about fifty colonies survive in Alabama, Georgia and South Carolina. They require a strict habitat and probably won't survive unless you have experience with aquatic plants and properly maintain them. The Cahaba Lily's beauty is an asset which may help save it from extinction. If it were ugly, who would care? Eventually, public awareness of these beautiful lilies may be the biggest asset in saving free flowing rivers themselves from mankind's indifference.